No matter when, where, or how you are trying to lose weight, it's hard. No matter your motivation, your medical status, or the stories you tell yourself about your weight history, losing weight and keeping it off is a difficult and long-term goal. Just because it's hard, though, doesn't mean that it's impossible. What it does mean is that you want to be smart about it. You don't want to waste your energy on making changes that aren't going to work, because then you will end up tired, discouraged, and unlikely to continue pursuing your goals. So what works and what doesn't? I'm currently working to lose weight from three pregnancies in three-and-a-half years, and I've done a lot of research into where to focus my energies. Here are a few changes you can make to both your thinking, and your lifestyle that should help you see visible changes in the way you look and feel. I know they have helped me! Most people think of weight-loss as short-term changes that help you lose pounds, at which time you can simply return to life as it is. However, one key to losing weight and keeping it off is thinking in terms of long-term lifestyle change. Making long-term changes tends to scare us, because most of us are comfortable with our lives the way they are. I knew that I had finally hit the point where I was ready to change when my mom was diagnosed with high blood pressure. That runs in our family, and I don't want it to be my struggle when I'm older. These are some ideas that helped me focus on which changes to make first. I wanted my changes to be sustainable. While I could lose weight fairly quickly by eliminating all sugar, for instance, I knew that I wouldn't be able to do that forever. So I chose smaller steps, like eliminating certain sugary items from my home, because I knew I could keep them up. I chose changes that targeted my ultimate goal. I read a lot about which foods help lower blood pressure levels, and I focused on incorporating those into my diet (such as the DASH Diet). Because I knew that they focused on my motivation behind wanting to lose weight, I had the motivation to make the changes. Weight loss simply doesn't happen (or isn't sustained) unless you change your life and keep it changed. If you really want to lose weight, the game starts in your head and involves getting to the point where you are willing to change — for good. 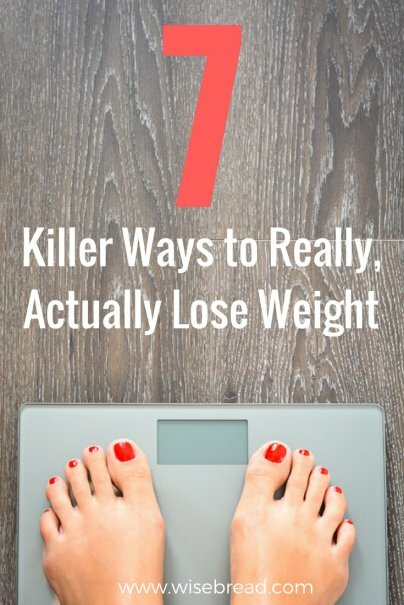 Because change is so hard, most of us want a quick fix when it comes to weight loss. We know that we can maintain a new diet or let ourselves be hungry for a fixed and relatively short period of time, and so we hope that that will be enough to get the weight off. But the truth is that change — real, long-term, lifestyle change — takes time. And real weight loss, especially, takes time. Think about it: Unless there was a significant medical situation that caused your weight gain, you probably gained fairly slowly. When I started my weight-loss journey, I was gung-ho for about three weeks. When I hadn't seen as much change as I wanted at that point, I felt like giving up. As I thought and researched, though, I learned what to expect from my body. Weigh myself everyday, so I could see how my weight fluctuated and know what was "normal" for my body. Record my daily weight, both to see how things progressed and because having the visual helped me process the information. Research the proper "target weight" for my body. While research couldn't tell me everything, it helped me to know that my goals were reasonable and achievable for where my body is right now. Keep in mind my ultimate goal. Since I want to be healthy for the rest of my life, I'm okay if it takes me a bit longer to get there. The benefits are so huge that I stay motivated even when things don't go as fast as my Type A brain would like them to. If you really want to lose weight, gear up for a long haul. You will need time to implement the changes you want to make, time to see what works for you, and then time to let them do their magic. I'm the first to admit that coffee is controversial when it comes to weight loss. However, I'd also be the first to tell you that it has been a huge help to me in my own journey. I have found that coffee reduces my appetite, even when I don't drink it with the pastries and breads you find in coffee shops. No one knows quite why this can happen, but it does seem to work for a lot of people. Because of the way carbohydrates interact with your body's system of storing and releasing glucose, eating carbs often means that your body tries to hold onto fat, rather than breaking it down to release the glucose. Reducing your carbohydrate intake doesn't mean quitting entirely, though. Fruits and vegetables have carbs, and those are generally in small amounts and formulated in a way where they are better for their body. Some people do choose to eliminate them entirely, though, and they find surprisingly yummy alternate ways to convey goodness into their mouths. If you're hesitant about taking this step, start by reducing or eliminating white carbs and sugar. Substitute brown rice for white, whole grains for processed ones, and sweet potatoes for white potatoes. You can even find recipes where most of the sugar comes from dates, rather than any type of processed sugar. When you have that down, you can decide whether to pursue further carb reduction/elimination. If this still seems intimidating, find some recipes that are low-carb. Search for recipes that are Paleo/Primal and Atkins compatible. Some South Beach Diet recipes will work, too. When you exercise with a friend, you not only have motivation to get out the door, but you have a whole community of friends who can help you celebrate when you reach your goals. These may be people you know, but they can also be people who you meet online, through an app or a message board. I know from experience that finding a workout buddy can be harder than you might expect. These days, everyone seems to have their own exercise plan and needs, not to mention schedules. I have finally found a friend to exercise with, at least some of the time, and this is what works for us. We have coffee after our workouts, so we get to connect, too, but don't have to do it while we're exercising. We chose a type of exercise that was new for both of us, so that neither would be the "expert." We only exercise together a couple of times a week, which accommodates both of our schedules. Working out with a friend can also make exercising feel less like exercising. It's almost like you have someone sharing the pain, so the burden is lowered. Then again, that may just happen for me. High intensity intervals are a huge fitness trend right now, but they're popular because they work. These kinds of workouts involve doing a lot of work in as short a time as possible. Then you often get a short rest, and go back to work again. Most of the workouts only take 15-30 minutes, but you work HARD while you're working out. There are a lot of studies on the benefits of high intensity intervals, and why they work better than traditional steady-state cardio when it comes to weight loss and other fitness improvements. The short version is that they make your body work harder, and in different ways, and the result changes your metabolism, at least for a few hours. When you start high intensity intervals, you'll want to start slowly. Work hard, but don't push yourself to the point where you are injuring yourself. Stop if you feel pain. Take a few breaths, and see if it goes away. If it does, you can keep going. If not, take a break. The most effective way to lose weight combines changing your diet, incorporating high intensity interval training, and then adding weightlifting. This can seem counterintuitive at first, but weightlifting adds muscle (and improves the quality of that muscle). Muscles require more energy than other types of tissue, even when you're not exercising, so having more muscle means that your body uses more energy, which eventually leads to weight loss. This is one of my favorite parts of my new routine. Right now, I try to do 3-4 workouts per week from the HIIT Mamas program. If you're not up for that much intensity, try one of these strength training app. I have done the Stronglifts program, and loved it, though I know people who vastly prefer Starting Strength. Whatever you use, find your gym time and commit to it, and you will see change. Some people, especially women, fear that lifting will make them look bulky. While this can happen, it's usually an extreme case. If you start training as a bodybuilder, you will become bulky. However, this usually involves trying to become bulky. The regular lifting of things — even heavy things — will not make you bulky. Instead, it will make you fit, which is the overall goal, right? I've lost about 10 pounds of the 30 that are my overall goal. I feel better than I have in months, and these changes are a huge part of the reason why. Are you trying to lose weight? What works for you? I'd love to know! I am loving the MyFitnessPal app to track my eating. I'm a 30 year old guy and I can eat a day's worth of food in a meal pretty easily with a couple bad choices. Being aware of the impact each food has on my numbers keeps me out of the fast food places. I want to eat as much as possible and stay within my daily calorie goals. I'm also a coffee fan, but the free kind at work. It feels substantial and moves me if you can guess what I mean. It's all about counting and reducing calorie intake. U can overeat even the good stuff and still gain weight. Simple, but not easy !